Simone Weil — philosopher, trade union militant, factory worker — developed a penetrating critique of Marxism and a powerful political philosophy which serves an alternative both to liberalism and to Marxism. 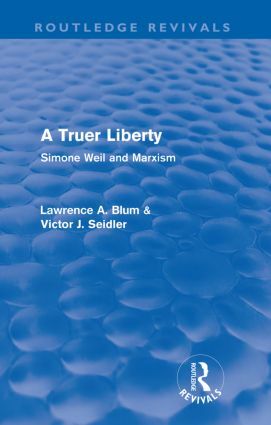 In A Truer Liberty, originally published in 1989, Blum and Seidler show how Simone Weil’s philosophy sought to place political action on a firmly moral basis. The dignity of the manual worker became the standard for political institutions and movements. Weil criticized Marxism for its confidence in progress and revolution and its attendant illusory belief that history is on the side of the proletariat. Blum and Seidler relate Weil’s work to influential trends in political philosophy today, from analytic Marxism to central traditions within liberal thought. The authors stress the importance of Weil’s work for understanding liberation theology, Catholic radicalism, and, more generally, social movements against oppression which are closely tied to religion and spirituality.